Natural blood purifier - Singhara is a good natural medicine to remove the dirt and toxic substances present in the blood. Appetite increase - If you or your children are not feeling hungry, then the Singhara can increase appetite. Asthma - For those who are asthma patients should consume 1 teaspoon of singhara flour with cold water. Regularization of such is beneficial in asthma. Reduce weakness in the body - If the muscles are weak or there is weakness in the body then you take singhara. By doing this, the body's weakness is removed. Enhancing the eyesight - Singhara also helps in enhancing the eyesight because it contains Vitamin A in the correct amount. 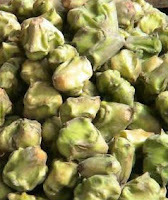 Good for bones - Due to the right amount of calcium, the singhara fruit strengthens the bones and teeth. So these are some advantages of eating Singhraha Even if you are not pregnant or pregnant you can also include WaterCaltrop in your diet for good health.Mostly this fruit comes in the winter time,you can eat it raw, boil or make its vegetable.